The year is 1939. The place is Nazi Germany. Standing by her little brother’s grave, nine-year old Leisel Meminger’s life is changed forever when she picks up a small object from the snow-covered ground. It’s a book – The Gravedigger’s Handbook, to be exact, accidentally left behind by one of the men who buried her brother. It’s also Leisel’s first act of book thievery, and the beginning of a lifelong love affair with books and those powerful little entities called words. With the help of Hans Hubermann, her kindly, accordian-playing foster-father, Leisel throws herself heart and soul into learning how to read. In due time, she’s “stealing” books from Nazi-book burnings, and even from the mayor’s wife, who deliberately leaves her library window open for that purpose. But Nazi-Germany is a dangerous place. And when Leisel’s family shelters a fugitive Jew in their basement, the young girl’s world is once more dramatically changed – both for better and for worse. 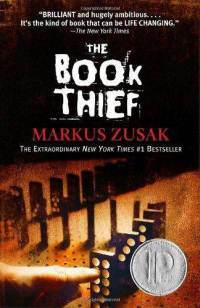 The Book Thief – written by Markus Zusak – is the literary equivalent of Roman Polanski’s film The Pianist (2002): artful, absorbing, devastating, beautiful. In short, unforgettable. And though it is classified in the Young Adult section of the bookstore, it deserves the consideration, not only of older teens, but of adults as well. … I’m always finding humans at their best and worst. I see their ugly and their beauty, and I wonder how the same thing can be both. In Zusak’s words, Death is “exhausted from his eternal existence and his job”. He is “afraid of humans – because, after all, he was there to see the obliteration we’ve perpetrated on each other throughout the ages” and he is now telling Leisel’s story “to prove to himself that humans are worth it”, that there is beauty among the ashes. Such a choice of narrators may sound odd, but it nevertheless works exceedingly well within the framework of the story. I like the idea that every page in every book can have a gem on it. It’s probably what I love most about writing – that words can be used in a way like a child playing in a sandpit, rearranging things, swapping them around. They’re the best moments in a day of writing – when an image appears that you didn’t know would be there when you started work in the morning. There truly is a gem on every page of The Book Thief. Zusak’s masterful word-craft grips you and begs you to linger over every other sentence, while the intensity of Leisel’s tale compels you to keep going. It is one of those rare cases where the storytelling is as excellent as the story itself. And the story is excellent. It is a story of love, loss, tragedy, and hope. A story where books are treasured and words are acknowledged as the powerful tools they are. The characters are all drawn with care and finesse, and it was with great reluctance that I turned the final page. I wanted to see more of these characters; I missed them, with all their quirks and flaws and virtues. As far as content goes, this is a book I would reserve for ages 15 and up. Violence and sexual content aren’t really an issue, but there is a fair amount of swearing, in both English and German. It’s not particularly strong, but it’s certainly not mild either, so discretion is advised. That aside, The Book Thief is magnificent and well worth your time. It’s exceptional prose and superbly crafted story make it possibly one of the best books I have ever read. Undoubtedly, it the best piece of fiction I’ve encountered so far this year. Looks like an interesting book, Corey. I definitely plan on buying this one for my eReader if its available. I think that it’s great that you have made a review on this amazing book. @Andrew: I believe it’s available as a Kindle download on Amazon. @Storydreamer: It is indeed an amazing book – one my of favorites now. Thanks for dropping by! I love this book, I read it a year ago and it has stayed with me since then. I agree that adults should read it too. I’ve been wanting to read this for some time now. Glad you enjoyed it! Great review, lookes like an amazing book. It is now on my list! @sorbetsuprise: It’s definitely a book that sticks with you long after you’ve read it. It puzzled me that it was classified in the YA section – it’s better than most “adult” fiction on the market. @Andrew: Hmmm. I don’t know. But considering that this book is relatively new, a bestseller, and an award-winner, I think the Nook library would carry it. And I just noticed that all the commenters on this post (with the exception of Andrew) have names that start with “S”. Too weird. I just finished this one this week, it was pretty good. It was a library copy so it was in poor shape (I was afraid the cover was going to disintegrate until I put some tape on it) but the words were unobstructed and I found it to be a very interesting story. I liked the scene when Leisel was going down Himmel St. after the bombs had hit, it was written quite nicely. Only thing that bothered me was the language, I don’t think a book that had that level of swearing should be in the kid’s section, teen and YA section maybe. I agree about the language – Book Thief isn’t something I’d hand to youngsters.